There's a store down the road from me that offers an unusual combination of items. It always makes me stop and wonder when I pass by. 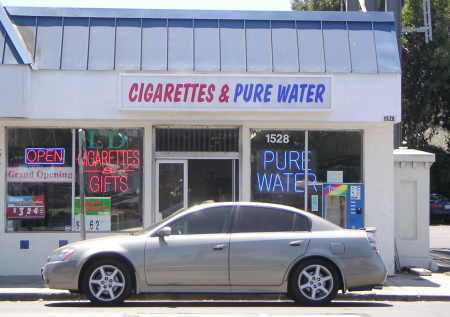 It must be my naivety and lack of marketing accumen, but it never would have occurred to me that cigarettes and pure water were two products that ought to be sold side by side. Part of my reason for keeping this blog is keeping records of when particular events happen. If there's no story attached, that doesn't necessarily make for interesting reading. So I'll be brief, and just mention that last weekend the mysterious chlorine smell (Dave calls it a bleach smell) was fairly strong up on Skyline near Castle Rock; but it was not noticable at all the previous super-hot week. There goes the theory that it's temperature related. And the bullfrogs are back at Walden West pond, though they're not croaking very actively. We even managed to spot a (huge!) tadpole, and the feet of something that looked like a crab but was probably a crayfish.